LNWR... Passengers welcome refurbished trains on Cambrian Line. The £9.5 million contract, commissioned by Angel Trains and delivered by leading UK rail maintenance specialist LNWR, started in early 2011 and was completed successfully with the final fully refurbished train now back in service on the Cambrian Line. The refurbishment, which took place at LNWR’s heavy maintenance and paint facility in Crewe, saw a complete re-fit of the trains to create a new carriage interior. Passengers have been so impressed with the work carried out that many thought that the trains were new. a new air-conditioning system in the cab to make the trains more comfortable for Arriva’s drivers. 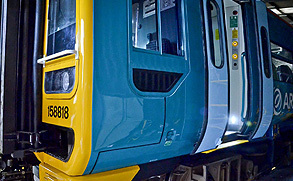 The trains have been repainted in Arriva’s eye-catching livery and have new windows. Work has also been carried out on the door entry system on the trains to extend their life and improve reliability. LNWR managing director, Mark Knowles, said: “Renovating the fleet was a major project and the experienced team we have at Crewe were central to its success. 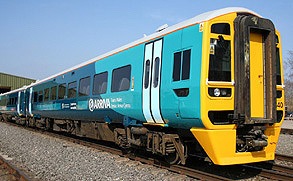 Angel Trains own the Class 158 fleet which is leased to Arriva Trains Wales. Mark Hicks, Technical Director at Angel Trains , said: “This is the first major contract we have carried out with LNWR and they have demonstrated the team-based approach needed for a project of this complexity.